It is so good to have access to an oven again. After a trying 6-7 months without one, the last few have been bliss. My last post talks about how to make a basic chicken roast in the oven. Every roast, chicken or otherwise, needs to be accompanied by a few yummy sides too. I only recently realized that I haven't posted too many such sides on my blog. Now that was just not done. I had to rectify that. Most of you know my deep rooted love for the humble potato in every form. This recipe here, is another good one. Its healthier than the regular french fries, but don't let that fool you. It tastes really good. I'm so happy to have tried this recipe. I know these wedges will make more than a few appearances on my dinner table. Cut the potatoes in half, lengthwise and each half into 4-5 wedges, equal in size. 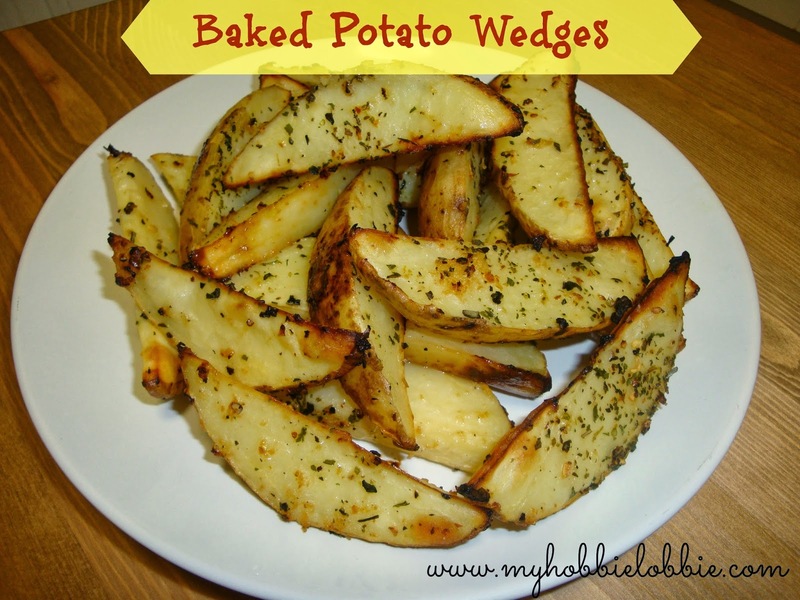 Toss the wedges with the rest of the ingredients in a bowl and make sure all the wedges are coated evenly. You can adjust the quantities of the seasoning to your taste. The quantities mentioned above work well as a guide. Line a baking sheet with foil. Place the wedges skin side down. Space them evenly so that they cook uniformly. Bake for about 30-35 minutes or until browned to your liking, crusty on the ends and tender inside. Serve immediately. Add more salt if needed while they are still hot from the oven. Sprinkle a little parsley over the potatoes and serve hot. I added this to my must make list. I've got everything on hand. Planning on serving these with chicken scallopini and grilled asparagus. Thanks for sharing the recipe! That sounds like a super yum meal. Thanks for stopping by! Delicious and lovely looking potato wedges. Must have been super duper awesome.